Pad Thai is arguably the national dish of Thailand. 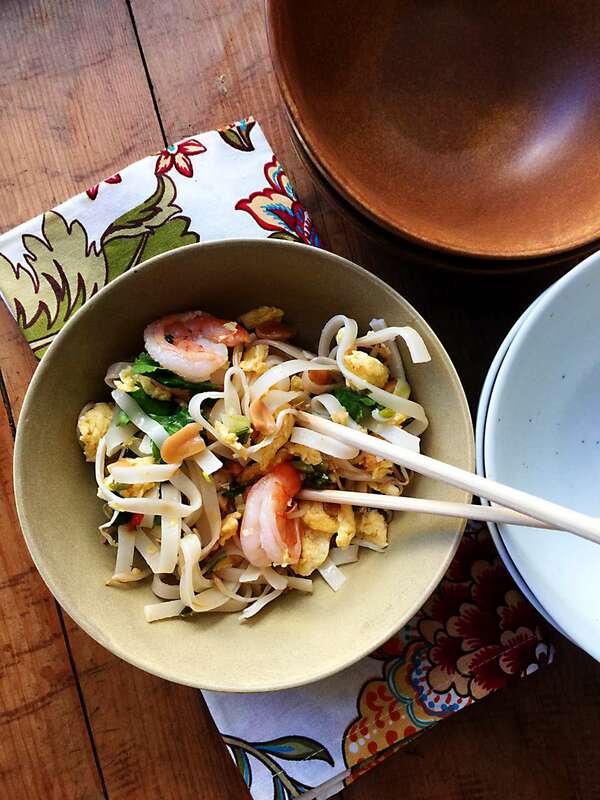 It’s a light and bright rice noodle dish made usually with shrimp, fish sauce, a touch of sugar, lemon or lime juice (or vinegar), chilies, bean sprouts, eggs, scallions, garlic and finished with crushed peanuts and sometimes fresh cilantro. It's is a perfect showcase for the addictive spicy, sour, salty and sweet balance of flavors of Southeast Asian cooking. My family LOVED this dish, and actually my younger son Charlie came in with his friend and said, “We smell shrimp and pasta and we’re not sure what else but it smells amazing.” And then they had seconds, which always brings a song to a parent’s heart, right? Rice Noodles are made with rice flour, instead of what flour, and very popular in all kids of dishes throughout Southeast Asia. They go from just cooked to mushy fairly quickly. They can be either soaked for an hour or so in warm water, or you stir them into boiling water for a few minutes until just barely soft, then drain and rinse under cold water to stop the cooking. They have a pleasant slightly chewy consistency. Fish Sauce: Fish sauce is usually made from just anchovies fermented in salt, and the initial fragrance can be intimidating, but it fades during cooking, and a little bit in so many dishes add fantastic, deep savory flavor with some saltiness. It’s like soy sauce meets Worcestershire sauce, and it’s a great key ingredient in Southeast Asian cooking. Thai Chilies: Also know as Bird’s Chili, or Thai Red Chilies, these are available dried or fresh and a very important part of Thai cuisine. When dried, they are a dark red in color, with a pronounced level of heat, and a little bit of smokiness. Bring a large saucepan of water to a boil. Remove the pot from the heat, add the rice noodles and stir frequently for 2 to 3 minutes until they are almost soft, but not quite. Drain the noodles and rinse with cold water. Set aside. Meanwhile, in a small bowl, combine the sugar, the fish sauce, and the lime juice, and set the sauce aside. Heat 1 tablespoon of the oil in the skillet over medium-high heat, and sauté the shrimp until they are just turning pink, about 2 minutes. Transfer them to a paper-towel lined plate to drain, set them aside, and wipe out the skillet. When the noodles have been drained, add the remaining 2 tablespoons of oil to the pan, and heat over medium high heat. Add the garlic, and sauté for just one minute until golden, then add the beaten eggs, and stir until cooked, about 1 minute. Add the noodles and stir to combine and heat through. Stir in the sautéed shrimp, and pour in the sauce. Toss over the heat for 2 minutes until the shrimp are just cooked through and the noodles are fairly soft. Add the scallions and chopped chilies, and toss over the heat for one more minute. Transfer to a serving plate. Sprinkle the platter with the bean sprouts, peanuts and cilantro, and serve hot.